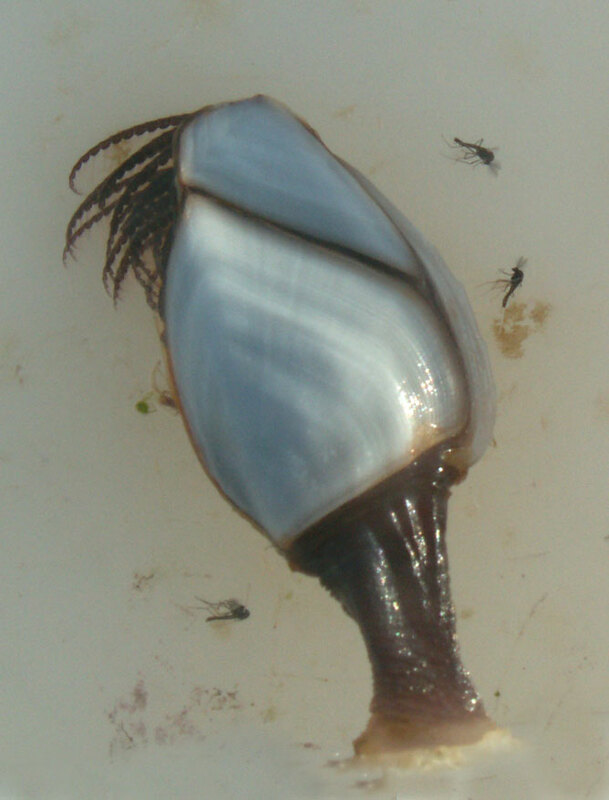 Amongst the debris washed ashore on Chesil Beach, Dorset, included Goose Barnacles, Lepas anserifera, Lepas pectinata andLepas hilli, and the rarer pelagic species Concoderma virgatum. 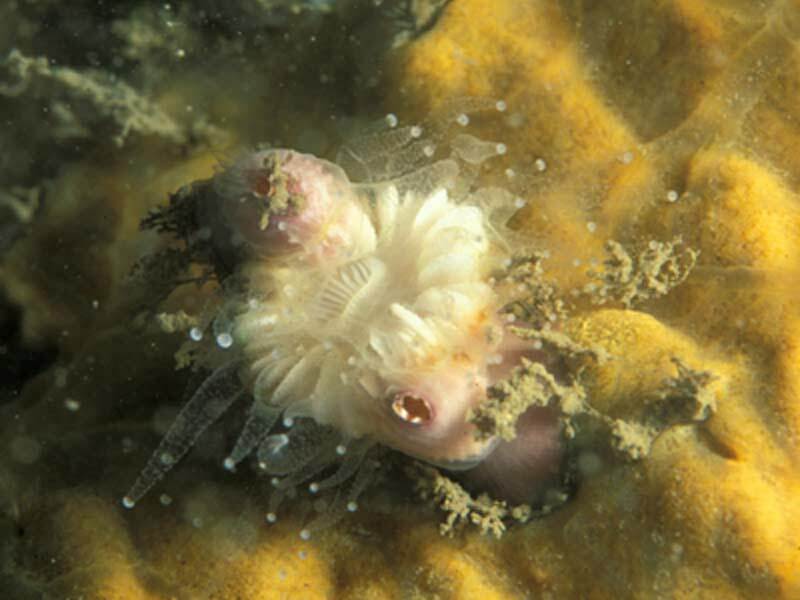 I had an exciting find on Chesil in the morning , the Stalked Barnacle Scalpellum scalpellum, living on the hydroid Nemertesia antennina, or Sea Beard, unlike the other stalked barnacles we are finding attached to flotsam, this species is British, living attached to hydroids on the reefs of Lyme Bay. 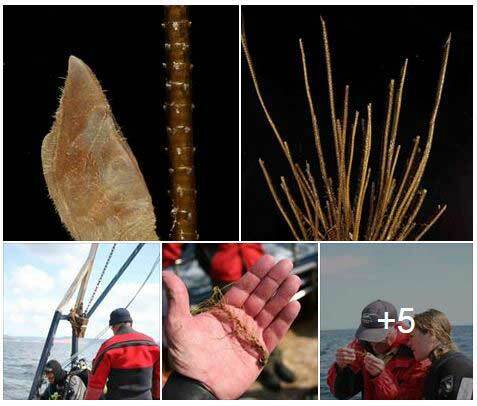 In 2010 we collected specimens for Danish scientists who were struggling to find the species. It was only because I had found them on the beach that we knew they occurred in Lyme Bay, diving at 30 meters on hydroid covered reefs paid off. 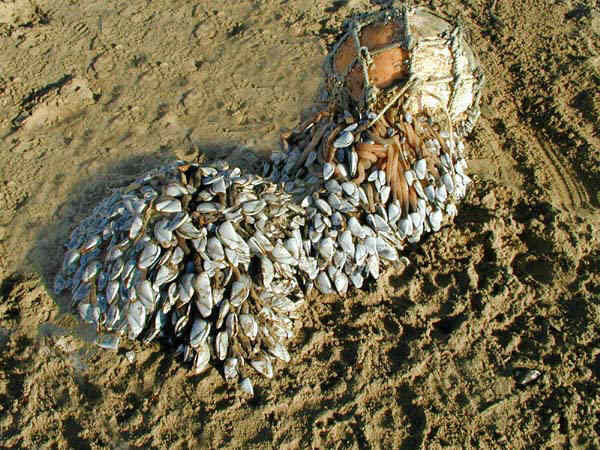 A large part of a space rocket floated across the Atlantic Ocean from Florida and acquired a large colony of Goose Barnacles, Lepas anatifera, on its one year journey. It eventually beached on Tresco, Isles of Scilly, with the assistance of local fishermen.. 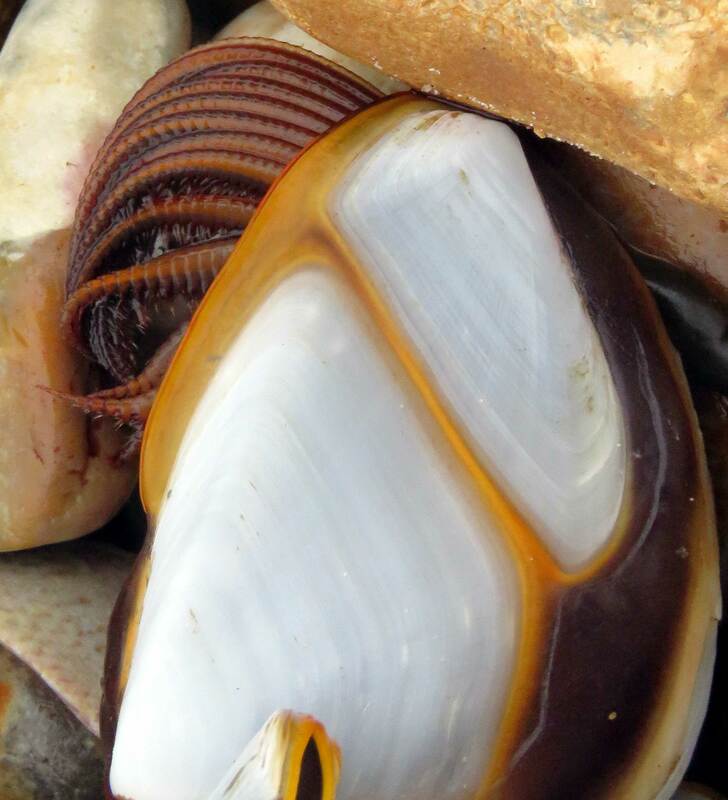 The pelagic Striped Goose Barnacle, Conchoderma virgatum, was spotted washed ashore on the Dorset coast. 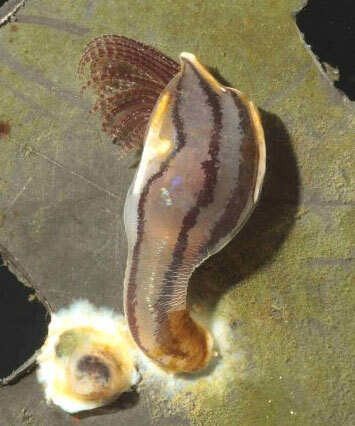 This is only the second known and recorded discovery of this species on the English coast. Another fishbox found at Marazion, south Cornwall, had a liberal covering of the live stalked barnacle Lepas pectinata. I find quite a lot of these and they're a very common find at the right time of the year, and can be found on many types of objects washed ashore, from macroalgae, feathers, bottles, margarine containers and workman's helmets. The species is quite variable in its sculpturing and is noted to be white or bluish. Indeed a few of the specimens on the fishbox had a bluish sheen, and it's the first time I've seen this. Lots of Buoy Barnacles, Dosima faciculalaria, now turning up at Sennen Cove, Cornwall, on feathers, string and more commonly Egg Wrack, Ascophyllum nodosum. 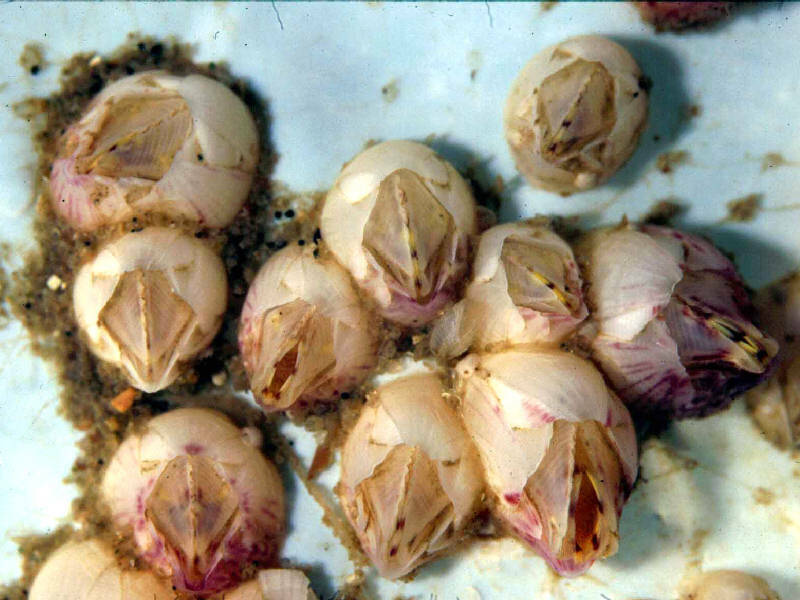 Also on the Egg Wrack is plenty of Lepas pectinatus, sometimes both species together. 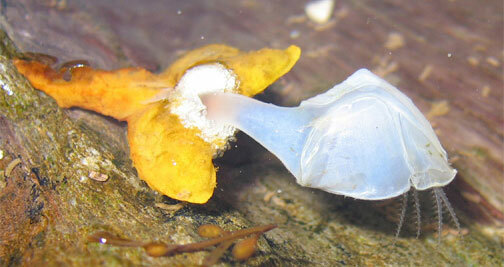 One or two old Lepas anatifera and a few large By the Wind Sailors, Velella, also found today. 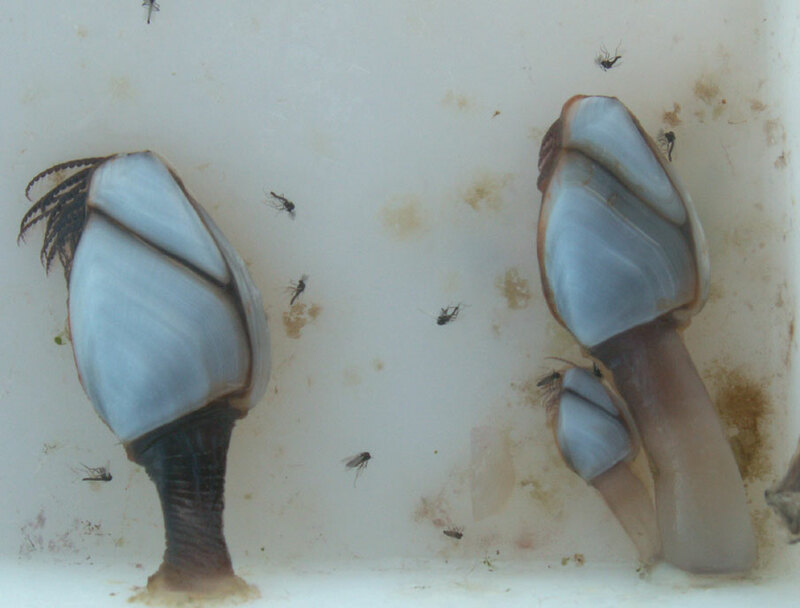 Two rarely recorded warm water species of barnacle have been discovered on fishing pots tackle off the coast of Guernsey in the Channel Islands. 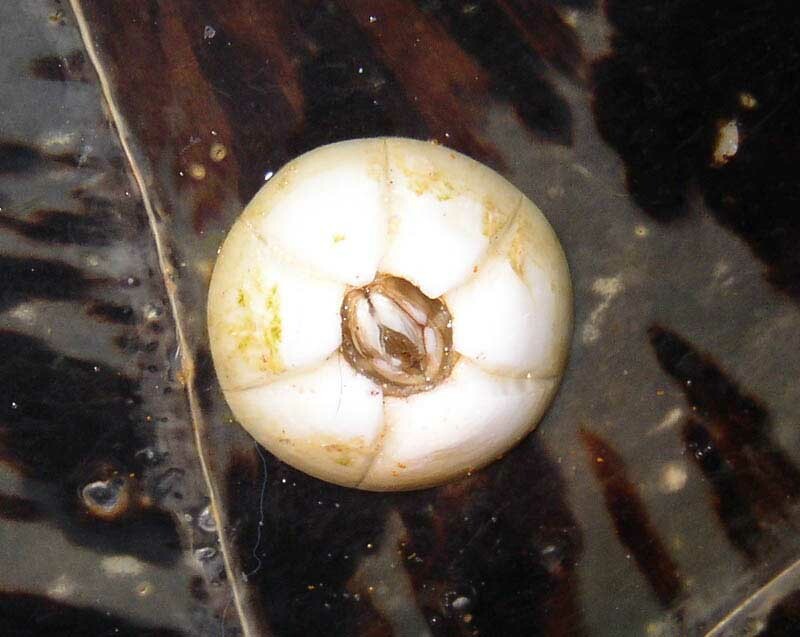 The Stalked Barnacle, Scalpellum scalpellum, was last recorded in 1862 although a specimen was found in 2003. The other species was an Acorn Barnacle, Solidobalanus fallax, (identified by Dr. Paul Chambers from Jersey) which was previously recorded off Plymouth. Yet more Stalked Barnacles today found east of Marazion, Cornwall, three lots; Lepas pectinata was found on a bucket ''Made in Canada''. The most unusual find was Lepas pectinata along with Sea Lettuce in a small M&S margarine container. Yet more Stalked Barnacles found today at Long Rock, Penzance, this time Lepas pectinata and Lepas anatifera on a miniature whisky bottle. Sadly the bottle was empty. A solitary mature By the Wind Sailor was also found. 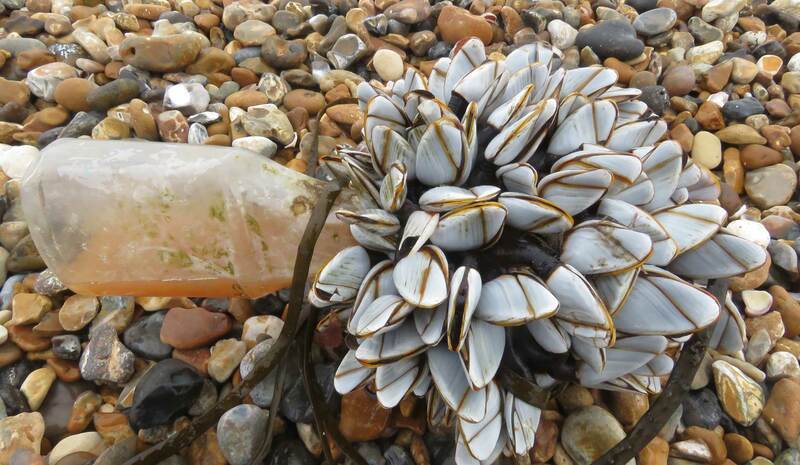 Strong south-westerly winds have blown many organisms on to Dorset beaches including the unusual pelagic Striped Goose Barnacle, Conchoderma virgatum. 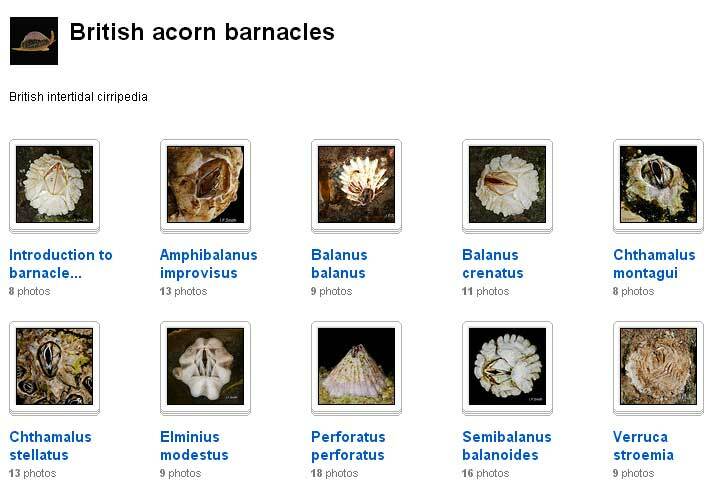 Four species of Stalked Barnacles; Lepas anserifera, Lepas hilli, Lepas pectinata and Lepas anatifera. 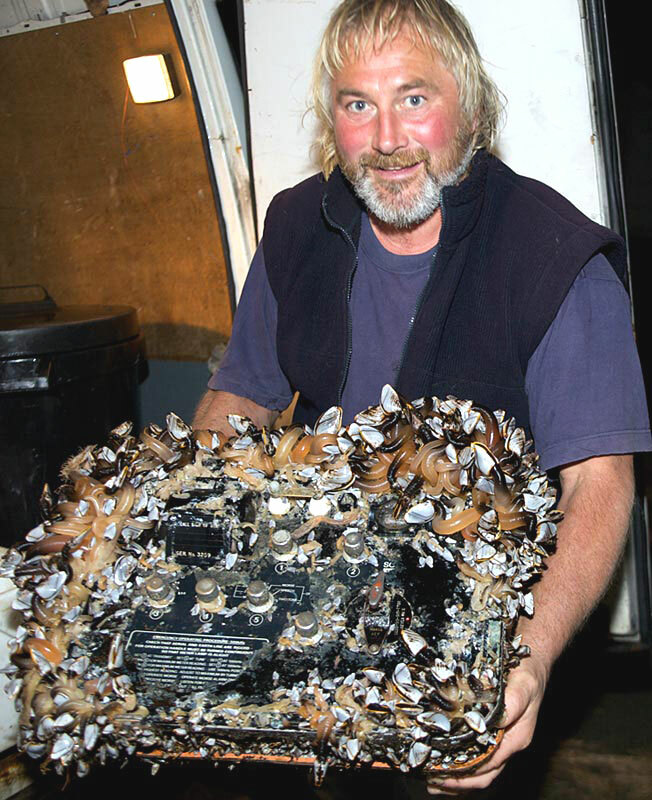 Commercial crab and lobster fisherman Clive Brown found what looked like a block of wood covered in Goose Barnacles, Lepas anatifera, floating off the south coast of Guernsey. When he retrieved the bulky mass of Goose Barnacles he found they were covering a piece of communication equipment. 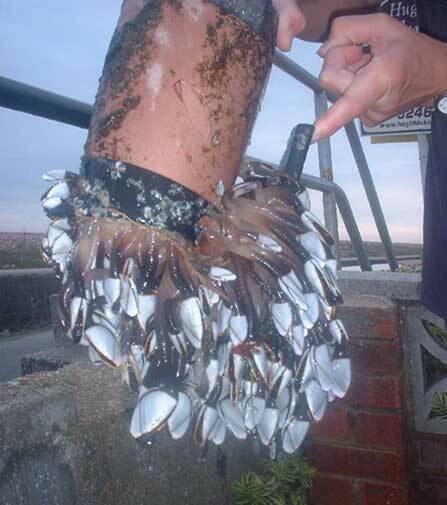 The image shows the equipment after 20 kg of the Goose Barnacles had been removed. Four Columbus Crabs, Planes minutus, were also discovered. These large acorn barnacles were seen on rocks along side the Newhaven Harbour Arm, East Sussex. 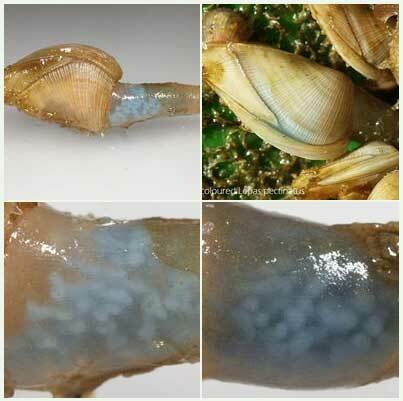 I think they are Balanus perforatus. This is a southern species that is found on the coasts of Devon and Cornwall and not usually recorded east of the Isle of Wight. 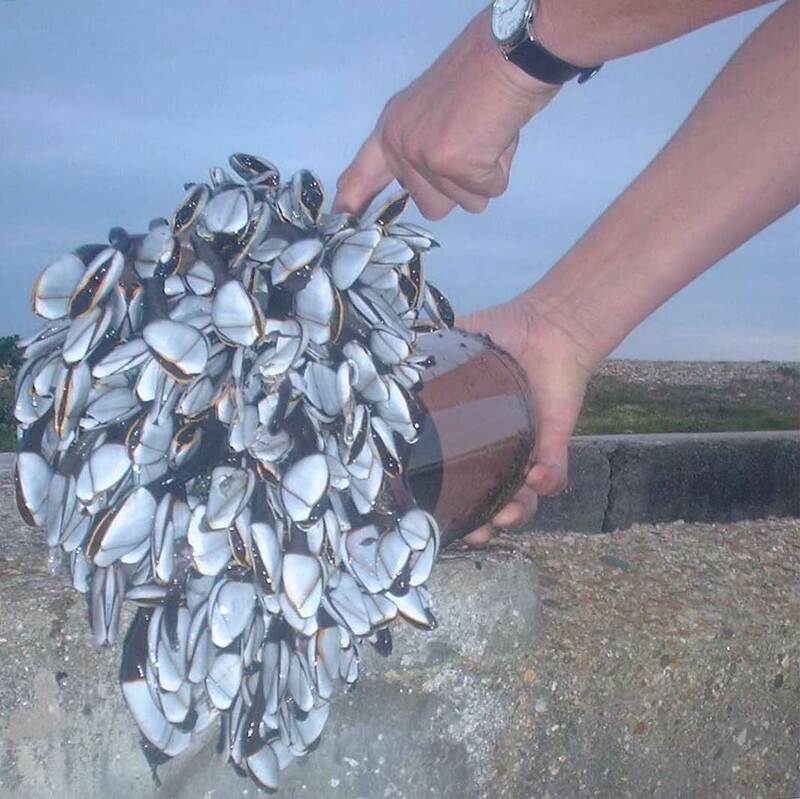 Several hundred Goose Barnacles, Lepas anatifera, were washed up near River Road, Littlehampton, Sussex, after the gales, some attached to chunks of expanding foam (could be Buoy Barnacles, Dosima fascicularis? ), others on pallet and lengths of rope. In excess of 200 Goose Barnacles, Lepas anatifera, were attached to a wooden pallet washed up at Wembury (near Plymouth), Devon, by the recent storms and they ranged in size from 5 mm to 20 mm. 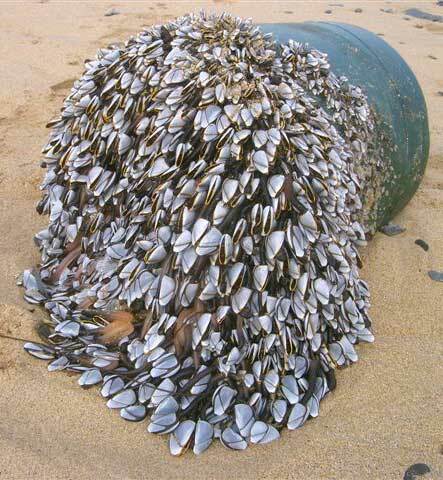 A float of Buoy Barnacles, Dosima fascicularis, are washed up on the north coast of Ireland. "We live on the shore in the south-east corner of Hayling Island in Hampshire, and have recently had spring tides and southerly winds, resulting in much debris being washed above normal high water mark. This morning I found a plastic jug (seven inches long with an aperture at the top of around four inches), and growing from the inside (and apparently filling it) is a most peculiar creature. From the top of the jug protrude more than a dozen slimy and jelly-like tentacles of dark colour and about half an inch in circumference. They all appear to emanate from a central body, which is obscured by the jug. Each of the slightly tapering tentacles is up to six inches long, and disappears into its own half-opened shell, which is stone grey and flattish and of irregular dimensions with a narrow ochre stripe on it. The shells are almost oblong or rhomboid in shape and no more than an inch or so long. When I found the jug and creature at high water mark, I noticed that the tentacles were stirring as if it were still alive, so brought it home and have placed it in a bucket of seawater in the yard. In the bucket, the smaller shells are opening and allowing a feathery set of fronds to come out and then retract as if the creature is either breathing or feeding." A mass stranding of By-the-wind Sailors, Velella velella, occurred on the Cornish coast at Porthcothan, Treyarnon, Constantine and other places from Sennen Cove (near Land's End) to Padstow. 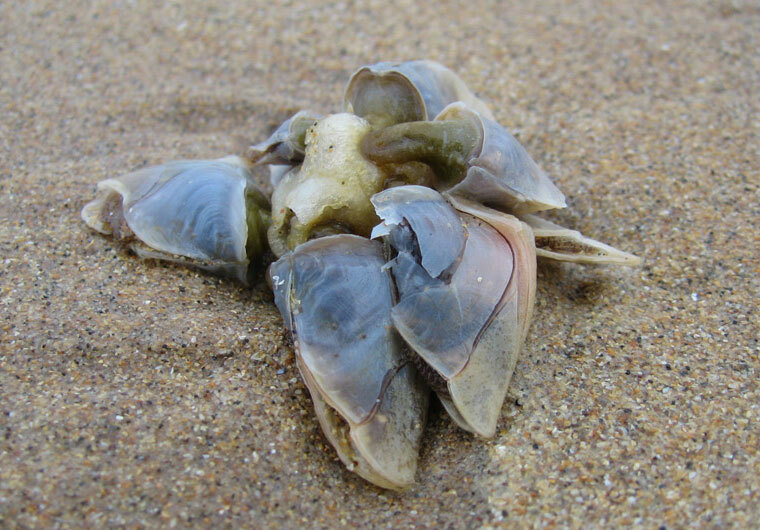 The Buoy Barnacles, Dosima fascicularis, started coming in on the same tide as the Velella. I've seen with my own eyes on Porthcothan (SW 8572), Treyarnon and Constantine and Paul Gainey saw them on Gwithian, all in north Cornwall. I'd be very surprised if they weren't all the way up the coast and I'd number them in millions, all big. 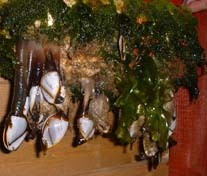 The Goose Barnacles are occurring in their usual quantity for this time of the year, if anything, less. To give you an idea, on my beach, Pothcothan, 25 acres at low tide: Velella approximately. one million, Buoy Barnacles: 2000+, Goose Barnacle colonies: 7. 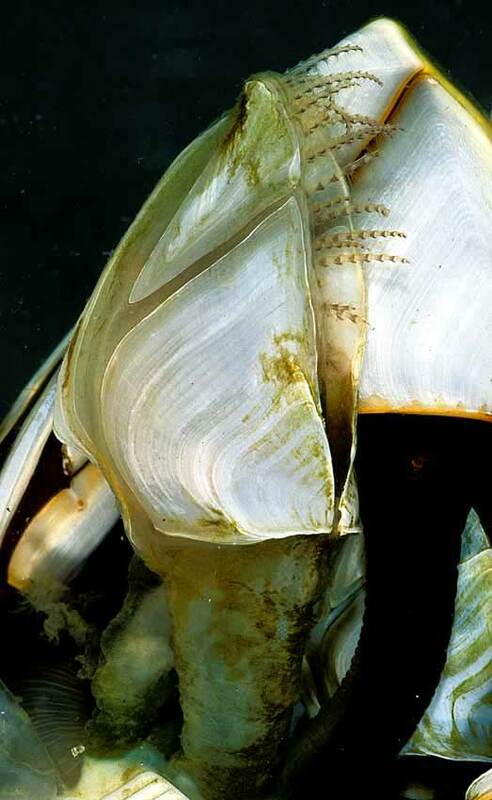 The Buoy Barnacles were attached to floats that they had secreted that have a texture like that of expanding foam. 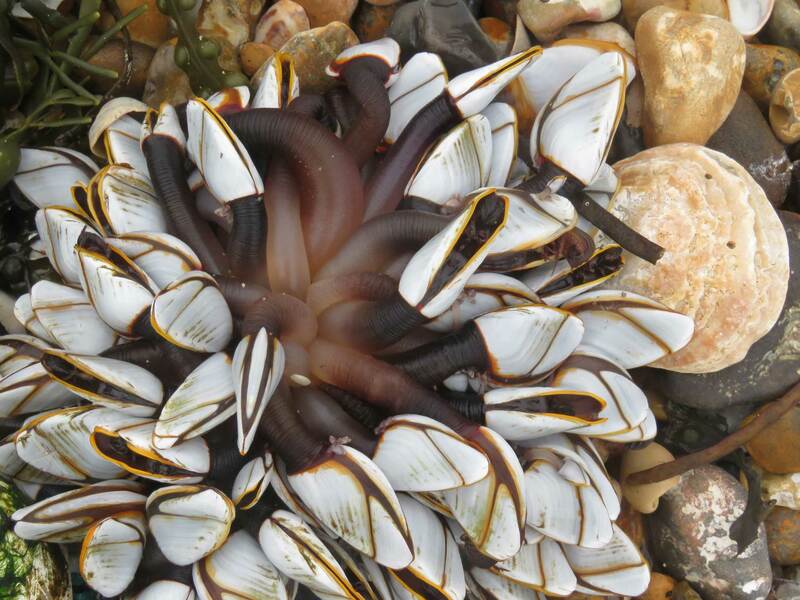 Goose Barnacles, Lepas, washed up on Constantine Beach, near Padstow, Cornwall. 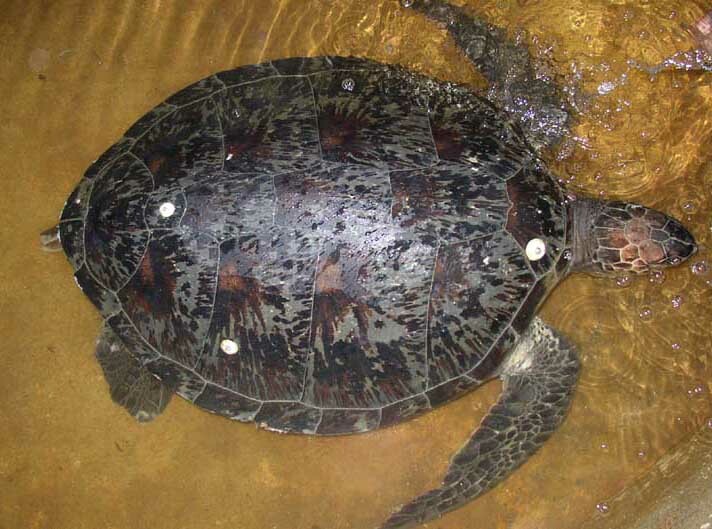 A live Green Turtle, Chelonia mydas, was landed on the west coast of Guernsey (Channel Islands) in the afternoon. Geoff George and Yvonne Chauvel discovered the turtle on Saline Beach. The Green Turtle has been treated by the States of Guernsey veterinarian and transferred to the Guernsey Aquarium at St. Peter Port. 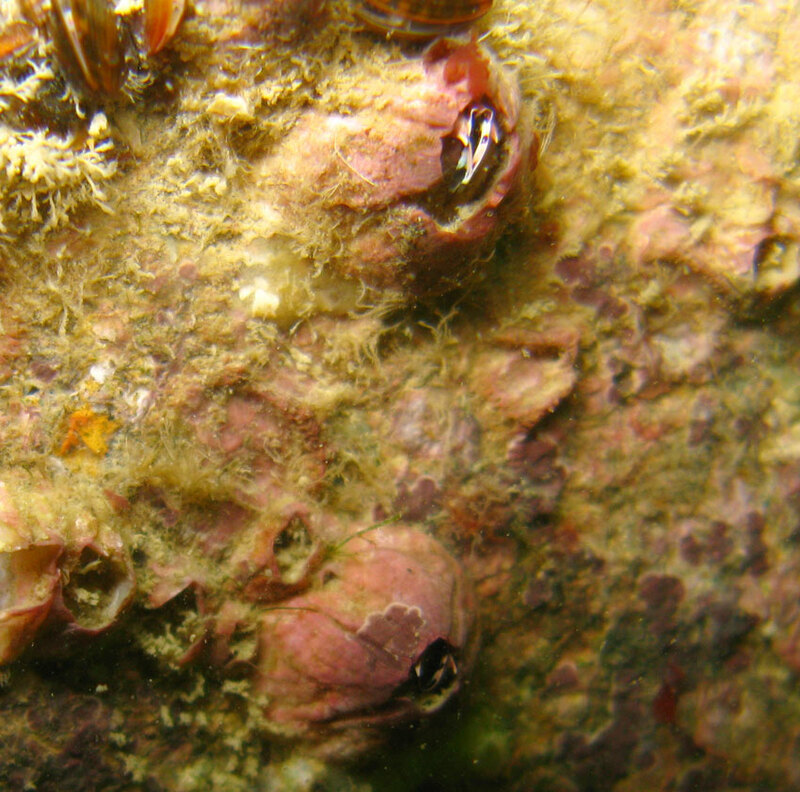 The white spots are a species of turtle barnacle, which may have not been recorded before on the British list of marine (barnacle) species (MCS Directory). It could be the species Chelonibia testudinaria, but this is only an educated guess. Taking up this theme of the wildlife that surrounds us, but which is terra incognito to most of us amateur naturalists, Barry Collins (wildlife warden for Thorney Island) contributes an apt example from his observation of a marker post recently washed up on the Pilsey Sands in Chichester Harbour, Sussex. 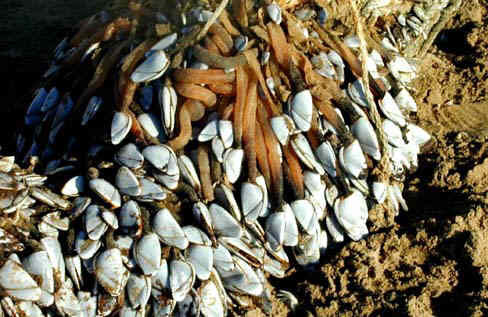 The section of the post which had for years been under water was covered with a thousand Goose Barnacles, Lepas anatifera, looking like silvery grey mussel shells around 5 cm (2 inches) long, each attached to the post by a long flexible brown stem which may be 20 cm (8 inches) long allowing the living crustacean to reach out into the surrounding water to feed. NB: On previous occasions, local buoys thought to have provided habitats for Lepas have discovered to be buoys from much further afield, e.g. meteorological buoys from the Atlantic Ocean. The report of an animal washed up at at Roseisle, near Burghead, Scotland, was bafflingly described as "a large body, measuring 2 by 3½ feet, and hundreds of legs everywhere" and "had loads of beaks like a puffin and every time he poured water over the creature, the beaks opened!". 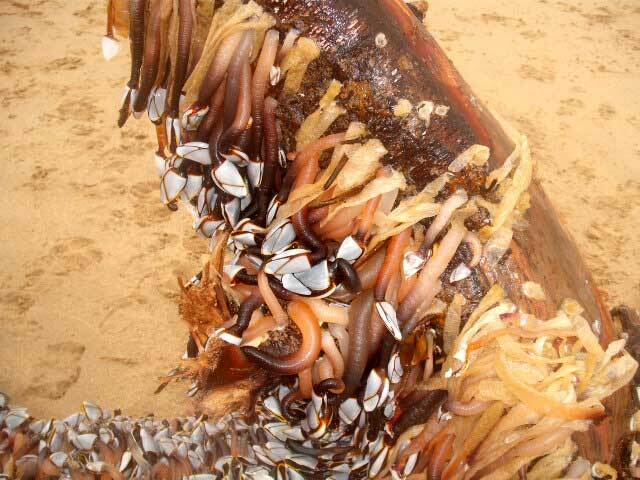 It was a colony of Goose Barnacles. Goose Barnacles, Lepas anatifera, are washed up on a plank at Borth-y-Gêst, near Porthmadog, north Wales (Tremadoc Bay, north bit of Cardigan Bay), and these attracted the curiosity of the public. After a few days of gales, I discovered my first Goose Barnacles, Lepas anatifera, on the Gower peninsular, south Wales, storm shore at Llangenith, after 25 years of searching the strandline. These are the barnacles in the photograph on the right and they varied in length rom 25 mm length down to small baby ones of 5 mm - 8 mm. Goose Barnacles, Lepas anatifera, attached by whitish stalks were washed ashore at Lannacombe Beach, between Prawle Point and Start Point, South Devon. They were attached to each other rather an external piece of flotsam, so they had been dislodged from their original attachment. 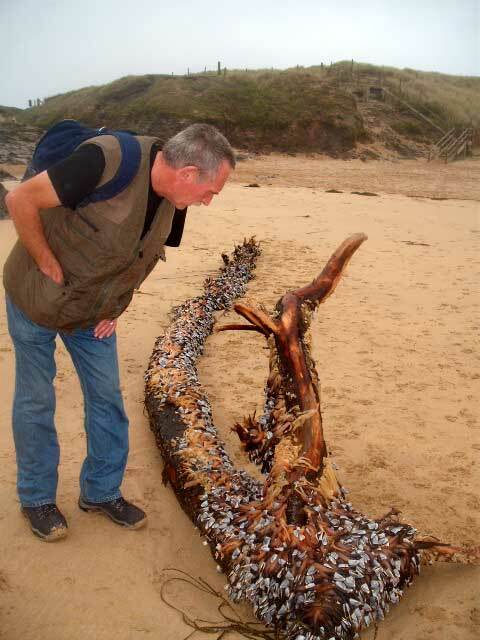 Report of large log washed up at the entrance to the Len Trench, on the north west coast of the Isle of Man, covered in Goose Neck barnacles, probably Lepas anatifera. I was on Hastings beach, East Sussex, and there were some Goose Barnacles, Lepas anatifera, washed up. They were still alive and attached to a bit of broken float. On Fistral Beach, Newquay, Cornwall, Matthew Slater found an exceptionally large cluster of Buoy Barnacles, Dosima fascicularis, (=Lepas), The group measured 30 cm across and all the individuals were alive The cluster can now be seen floating in the Blue Reef Aquarium, Newquay The northerly and north-west winds are likely to bring ashore more members of the warm-water, open sea community - so watch out! 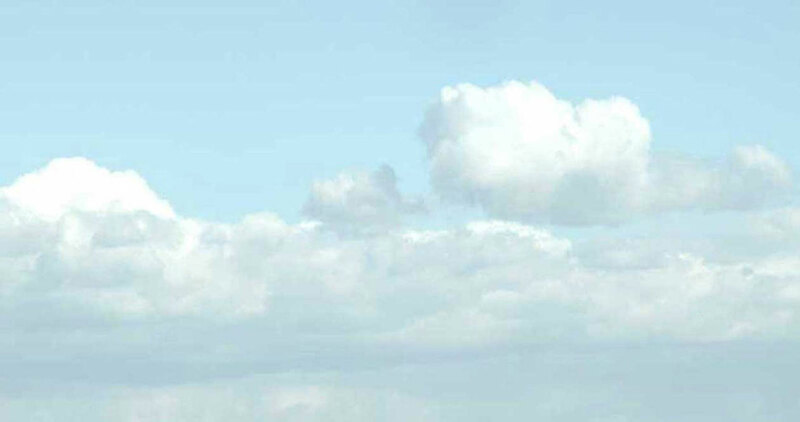 We have had SW prevailing winds all week after the huge gales. We estimate there are 300 barnacles on the buoy and this is not a recognised British type fender, as noted before. Tiny barnacles are also present. 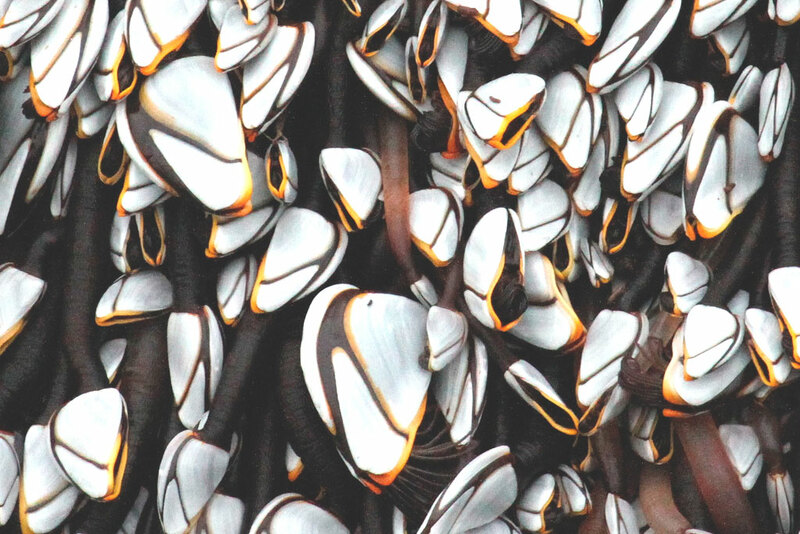 Goose Barnacles, Lepas anatifera, were washed up between Seaton and Axmouth, in Lyme Bay, Dorset, on fenders from an American boat, so they may have drifted all the way across the Atlantic Ocean. Chris Hicks (Norfolk) discovered a piece of Teredo-riddled timber with Goose Barnacles, Lepas anatifera, attached on the strandline at Brightstone Bay, Isle of Wight. Subject: Portuguese Men o'War etc. Also, many Buoy Barnacles, and literally thousands of By-the-wind Sailors Velella, on Porthcothan but none on Watergate and Mawgan Porth. I've always thought of these as predominantly south-westerly strandings, Porthcothan is a NW facing beach, and our recent gale was NW. Still in Isles of Scilly mode I'm afraid! We saw a fair few Goose Barnacles washed up on the sandbar between St. Agnes and Gugh. 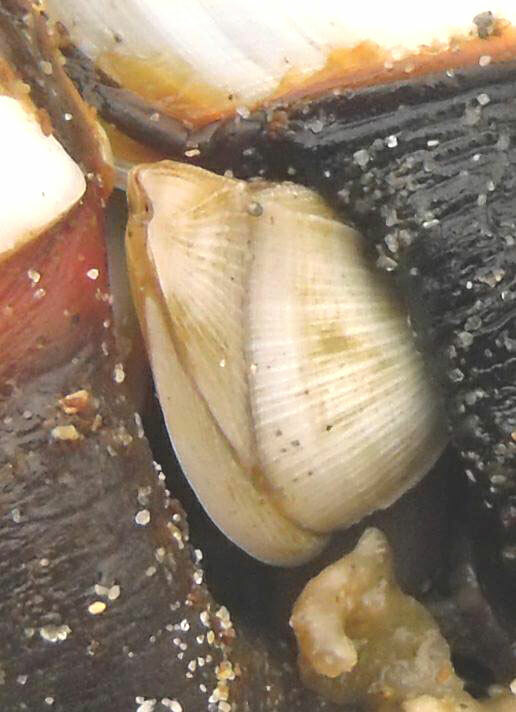 On Perranporth Beach, Cornwall, Paul Gainey found a large coconut, still with its outer husk, as well as Buoy Barnacles (Lepas fascicularis) and By-the-Wind Sailors (Velella velella). 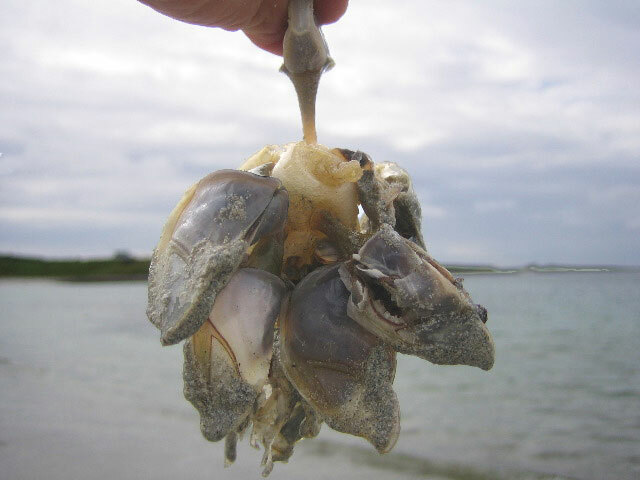 These Cornish Environmental eForum pages contain many Goose and Buoy Barnacle reports. See Smaldon & Lyster (1976). Ross et al. 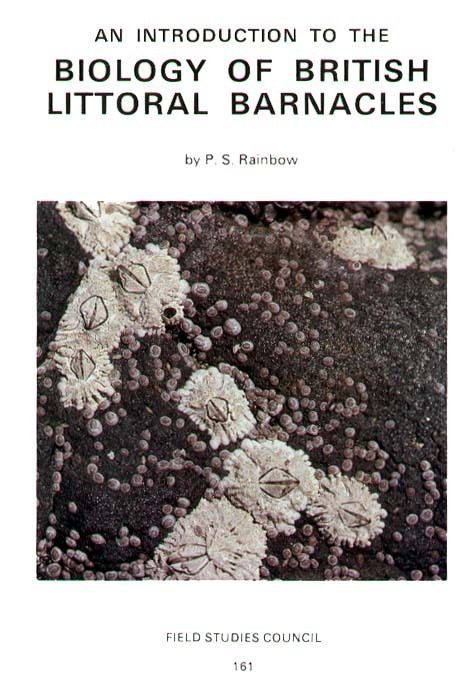 (2003) A key for the identification of the Nauplii of common barnacles of the British Isles, with emphasis on Chthamalus. Journal of Crustacean Biology. Volume 23. Pages 328-340."